Des Dômes Et Des Minarets reports that on Sunday night a number of Muslim-owned buildings in the town of Vendôme, in the Loir-et-Cher department in central France, suffered graffiti attacks. 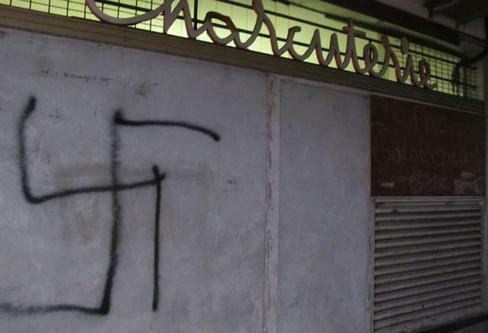 Swastikas and racist slogans (such as “I love Whites”) were sprayed in black paint on the walls of a mosque and Turkish restaurants and cafes. Around a dozen examples were found, all in the same paint and handwriting. This entry was posted in Far right racists, France by Bob Pitt. Bookmark the permalink.